Odisha at a Glance: Tourist and Picnic Places of Nayagarh District in State of Orissa , India to See Famous Temple of Lord Nilamadhava, Raghunath and Lord Ladubaba and beutiful Satakosia Gorge in River Mahanadi. Tourist and Picnic Places of Nayagarh District in State of Orissa , India to See Famous Temple of Lord Nilamadhava, Raghunath and Lord Ladubaba and beutiful Satakosia Gorge in River Mahanadi. Ranapur: 30 kms from Nayagarh, Ranapur is a picnic spot. The temple of Goddess Maninageswari on the picturesque Maninag hill top attracts the tourists. GokulanandaPitha : Near to Kantilo Nilamadhaba , a beautiful place for Picnic and Nature Lover. 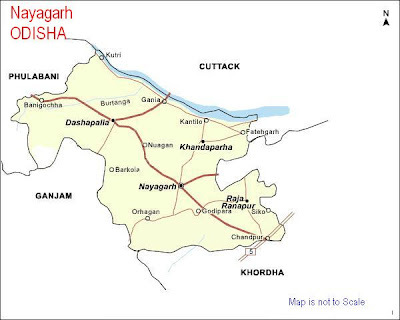 Nayagarh Town one of the district head quarter of Orissa / Odisha State of India. This town is well connected with Berhampur, Khurda, Bhubaneswar and Balangir in road. You can find buses from Bhubaneswar through Khurda in every One hour up to 10 PM. It will be about 85 K.Ms from Bhubaneswar. Connected Railway Stations are Bhubaneswar, Khurda Road and Berhampur. You can stay here to visit all its nearest Tourist Places.